54 • RV PRO • September 2018 rv-pro.com R V M A N U F A C T U R E R S GRAND DESIGN Grand Design RVs wowed attendees to last year's Open House and, if anything, company executives expect to do even better this year. Nate Goldenberg, general manager of Grand Design's Soli- tude and Momentum lines, says the RV maker plans to intro- duce more things this year than it has in the past five-and-a-half years of its history. "I know it sounds like a tall order, but we've been busy," Goldenberg says. "As a company, we do a good job of really listening to our customers and our dealer needs. And, because we've had so much facility expansion here, it's created some opportunities to get into some different segments that we hav- en't been in in the past." Just how busy is a little hard to quantify, but Grand Design – which is known for its high-end, high-value fifth wheels – is working on taking some of the features from its lines and tweaking them to reach more-modest price points. Solitude Last year, Grand Design talked about coming into the market with something more affordable. This year it's done the trick with its S Class fifth wheel designs. "It's something our dealers have been asking for," Goldenberg says. "They were wanting bunk floorplans and smaller rear lounges." 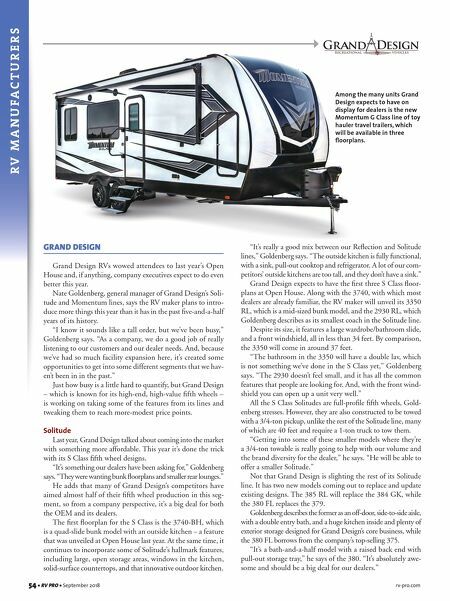 He adds that many of Grand Design's competitors have aimed almost half of their fifth wheel production in this seg- ment, so from a company perspective, it's a big deal for both the OEM and its dealers. The first floorplan for the S Class is the 3740-BH, which is a quad-slide bunk model with an outside kitchen – a feature that was unveiled at Open House last year. At the same time, it continues to incorporate some of Solitude's hallmark features, including large, open storage areas, windows in the kitchen, solid-surface countertops, and that innovative outdoor kitchen. "It's really a good mix between our Reflection and Solitude lines," Goldenberg says. "The outside kitchen is fully functional, with a sink, pull-out cooktop and refrigerator. A lot of our com- petitors' outside kitchens are too tall, and they don't have a sink." Grand Design expects to have the first three S Class floor- plans at Open House. Along with the 3740, with which most dealers are already familiar, the RV maker will unveil its 3350 RL, which is a mid-sized bunk model, and the 2930 RL, which Goldenberg describes as its smallest coach in the Solitude line. Despite its size, it features a large wardrobe/bathroom slide, and a front windshield, all in less than 34 feet. By comparison, the 3350 will come in around 37 feet. "The bathroom in the 3350 will have a double lav, which is not something we've done in the S Class yet," Goldenberg says. "The 2930 doesn't feel small, and it has all the common features that people are looking for. 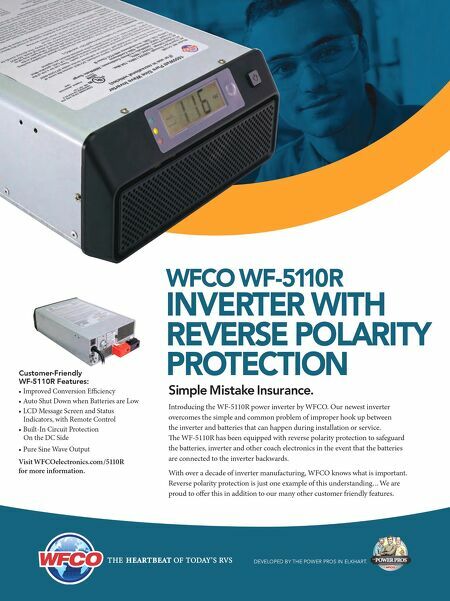 And, with the front wind- shield you can open up a unit very well." All the S Class Solitudes are full-profile fifth wheels, Gold- enberg stresses. However, they are also constructed to be towed with a 3/4-ton pickup, unlike the rest of the Solitude line, many of which are 40 feet and require a 1-ton truck to tow them. "Getting into some of these smaller models where they're a 3/4-ton towable is really going to help with our volume and the brand diversity for the dealer," he says. "He will be able to offer a smaller Solitude." Not that Grand Design is slighting the rest of its Solitude line. It has two new models coming out to replace and update existing designs. The 385 RL will replace the 384 GK, while the 380 FL replaces the 379. Goldenberg describes the former as an off-door, side-to-side aisle, with a double entry bath, and a huge kitchen inside and plenty of exterior storage designed for Grand Design's core business, while the 380 FL borrows from the company's top-selling 375. "It's a bath-and-a-half model with a raised back end with pull-out storage tray," he says of the 380. "It's absolutely awe- some and should be a big deal for our dealers." Among the many units Grand Design expects to have on display for dealers is the new Momentum G Class line of toy hauler travel trailers, which will be available in three floorplans.